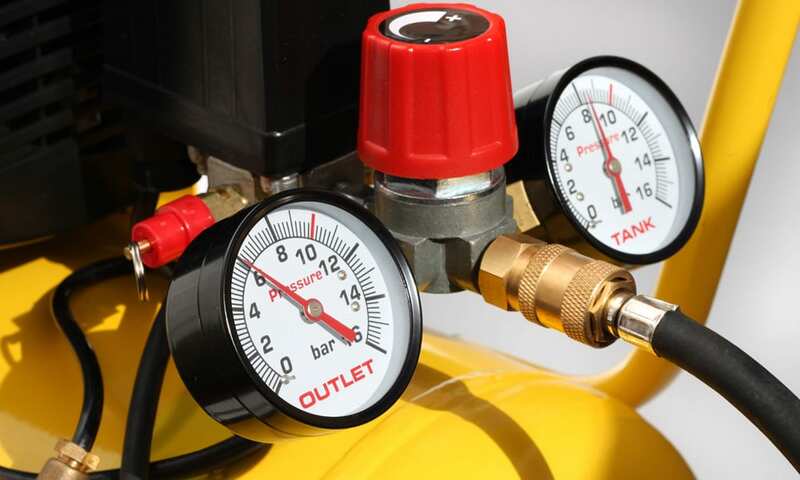 30 Gallon air compressors are a popular, pretty standard type of air compressor. They are technical machines used in industry, but often also at home. Though the air compressors used at home are often smaller than 30 gallons as they are more portable. When deciding which air compressor to purchase, it can become overwhelming as there are many different features and specifications available. So unless you are well versed, and up to scratch with your air compressor knowledge, you may feel a bit confused or lost. However, there are key specifications that your air compressor should follow. Alongside these, there are personal choices to take into consideration as well, for example, color and style, oil or non-oil lubricated and ease of use, i.e. portable vs. stationary air compressors. Still scratching? Read on to find out ten of the best 30-gallon air compressors around at the minute. View the Best 30 Gallon Air Compressors, Below. What do you need to Consider Before Buying? How much Horsepower Does a 30-Gallon Air Compressor Need? How do you Drain a 30-Gallon Air Compressor? Looking for a smaller capacity? Try these 20-Gallon air compressors. Below is a list of ten of the best 30-gallon tank air compressors available to purchase currently. They vary from product to product, but all have great reviews and get the job done. Industrial Air is first up, and they have offered a 30-gallon air compressor that is made with cast iron material. Cast iron is a popular choice for air compressors as it is often long-lasting and extremely durable, something that is utterly important when it comes to industrial equipment in constant, regular use. The pump is oil lubricated which means there is an additional cost of sourcing and supplying oil for the tank to remain functional, however, oil lubricated tanks are often preferable on bigger models as they provide extra durability and sustainability. This product is exceptionally easy to use, with a control panel that is clear and manufacturer's guidelines that are concise and self-explanatory. It has a good PSI capacity and will fit in well with any workspace. DeWalt are a popular choice for air compressors, often producing top quality products that stick around for a long time. This particular model is the Two-Stage and is again made from a cast iron material with of course the all-important 30-gallon tank. This time, DeWalt has opted to go oil free with the tank which comes with its advantages. For example, no extra costs are associated with the running, and the parts are much less maintenance than oil-lubricated tank models: which is great! It also comes with a two-year warranty, which other competitor products are lacking. This means you have a bit of peace when it comes to part replacement and maintenance if the need should arise. However, the reviews clearly commend DeWalt for a very well made product so perhaps you won't need the warranty. This is a good choice for any workshop or workspace. The tank is quite heavy and not overly portable, so it will need a more permanent base to call home. Husky C303H High Performance does what it says on the tin, in that it is undeniably high performance. It is electrically powered with a large capacity and works quietly in any workspace. In fact, it registers as less than 80 decibels, which is almost a miracle for such a big capacity high functioning piece of equipment. This air compressor has a high PSI capacity with multiple output functions. It can operate different tools at different times which is handy for a fast-paced multipurpose workspace environment. It is also portable, which a lot of air compressors of this capacity are not. With such a quiet running capacity, this is a good option for hobbyists and working people alike. It will fit in well with any environment and performs at a high capacity, at such an affordable price. Here is a gas powered air compressor from NorthStar. This air compressor is quite heavy and therefore must remain stationary in that it is not really easy to move around after being installed, set up and set off running. It is, however, extremely easy to use and get used to, and comes with very clear and concise instructions from the manufacturers themselves. 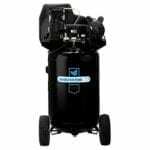 A great bonus for this air compressor is the fact that it comes with a good, long warranty that will give you some comfort and security in case anything goes wrong. Not that anything will go wrong, as the product has such good reviews it seems entirely unlikely. This has a high PSI capacity with multiple output options making it ultimately a great addition for any workshop that is in need of an air compressor. The Porter Cable PXCMLC Single Stage air compressor is another good, solid 30-gallon tank air compressor. It also has the added, rarer benefit of being fully portable so you can move it from place to place. Do bear in mind though that the place you move it to needs to have a power supply as this is an electric air compressor that requires a plug socket to function. It has an average PSI capacity, about the standard for an oil lubricated tank. Remember that oil lubricated tanks come with their perks (longer lasting, harder working) but you also have to factor in the cost and replenishment of the oil supply to make sure the machine does not stop working prematurely. They also require a bit more maintenance than oil-free tanks. Though the maintenance may seem daunting, as long as you follow the manufacturer's guidelines you won't go wrong. All in all, this is a good choice for a standard air compressor. They are reliable, well maintainable and durable products that come from a well trusted and well-established company. DeWalt have another option available here, in the shape and form of their single stage air compressor. It still has a 30-gallon tank and can reach a maximum of 155 PSI, which is quite a lot and therefore functions at a high capacity. It is electric, so will need to be near a power source in order to work properly and this should be planned out before purchasing as you don't want to get your shiny new air compressor back to your workspace only to find out you have to work in an awkward position owing to lack of power supply! However, with that in mind, it is a very quiet air compressor (under 70 decibels) which means it would be a great addition for a hobbyist or a quiet workspace. It also features an oil-free tank which means next to no maintenance and therefore a lot less work! This air compressor has a lot of good reviews and is from a good company. You can trust that is has been well made and will do the job you want it to do. This is a portable air compressor with a high capacity. Owing to its portable nature, it can be moved from place to place and therefore you are less restricted in your work movements if this is something that is important to you. It is very quiet and can, therefore, be very suitable for a home workspace or a quieter work environment as well as any other! It is electric so will need a dependable and reachable power supply. The IngerSoll-Rand SS3F2-GM Garage Mate is very easy to use, has an oil-free engine and up to a 135 PSI capacity. Furthermore, owing to its cast iron frame, it is highly durable and can withstand the majority of work environments. Owing to its portable and quiet nature, this would be a good choice for a home hobbyist looking to add that professional edge to their enjoyment. Campbell Hausfeld Single Stage air compressor is neat, looks good and has a 135 PSI capacity. This is average, but still very good and will be more than enough to get the job done that you need it to. This model is portable; with wheels attached to aid movement around the workspace should you need it. However, it is electric so remember that wherever you wheel it to, it will need a power source in order to work. The tank is oil-lubricated which means there is more maintenance involved. It is important to maintain oil-lubricated tanks with the correct oil (found in the manufacturer’s guidelines and often available from the manufacturer) so that they continue to function to their full capacity. This air compressor is lighter, compact, and portable which are all great features for an air compressor that is going to be in your home environment or a smaller professional workspace. Industrial Air Cast Iron compressor is made from sturdy cast iron material in a cylindrical fashion in order to provide the best sustainability for the product. It is built to last, and it is built strongly. It has a really good PSI capacity, 155, and this can be spread between multiple outputs if this is something that you require from your air compressor. The tank is oil lubricated, so again there is extra maintenance involved and extra costs; make sure this has been taken into consideration before selecting this air compressor product. This is a really good option for a 30-gallon air compressor, though not top of the list it definitely still has some great features and capacities that keep it as a contender and viable buying option. DeWalt have another product, this time more portable than the previously discussed models above. Portability is a great asset for any air compressor to have, especially when a part of a smaller workspace. It just means you are not restricted to one place of working and you can move around the workspace as and when it suits you – as long as you are near a power supply as this air compressor runs off electricity! It has a great PSI capacity and also an oil lubricated tank (extra maintenance, extra costs you know the score). Though don’t let that put you off, because DeWalt know what they’re doing and how to build a good, durable air compressor that will take you where you need to be. This is a classic cast iron design, fully portable and very lightweight. It will fit well into any workspace and is a great addition for any hobbyist or professional! 1. Where is the air compressor going to operate from? This will dictate the shape and size of the compressor and also the power source (gas or electric) of the air compressor. 2. What is the air compressor going to be required to do? To answer this, consider what you will be using it for and therefore what the expected workload of the compressor will be. This will dictate PSI capacity and horsepower required. 3. Do I need it to be portable? If you have a smaller workspace or multiple people using the air compressor, this may be something you need to factor in before making a commitment. 4. Do I want an oil-lubricated tank? Consider the extra costs of oil and extra maintenance that come with an oil lubricated tank, as there are great non-oil lubricate tank options when it comes to air compressors as well. CFM is a technical term associated with all air compressors. What it means is ‘cubic feet per minute.’ In non-technical terms, that translates to at what pace the unit can supply air to the tool/tire you are wanting it to supply air to. This is an important thing to think about for any workspace as some faster-paced work environments may need something that can supply their tools more rapidly than say a hobbyist. This is quite an important consideration. You want something that will do the job quickly especially if you are working to a strict time frame. You also need a compressor that can supply air at the pace you need to work; otherwise, it will be a frustrating and lengthy process. There are processors out there that can keep up to pace, but they are worth sourcing out from reviews and product specifications to match up to your specific requirements otherwise you may end up with a product that just is not a good fit for your work needs. Therefore the higher the CFM (cubic feet per minute), the more tools you can power at any given time. You need to know your tool requirements before committing to an air compressor purchase as they need to be a good fit for each other. All air compressors vary from product to product, and as with anything it is well worth checking out some reviews beforehand to see what you might be letting yourself in for. Those looking for something industrial may be more interested in these serious 60-gallon compressors! This is surely the big question on everyone’s lips – do I go for an oil-free or oil lubricated tank?! It is up to you to weigh up the pros and cons and do your research but read on below for some pros and cons of each variety. 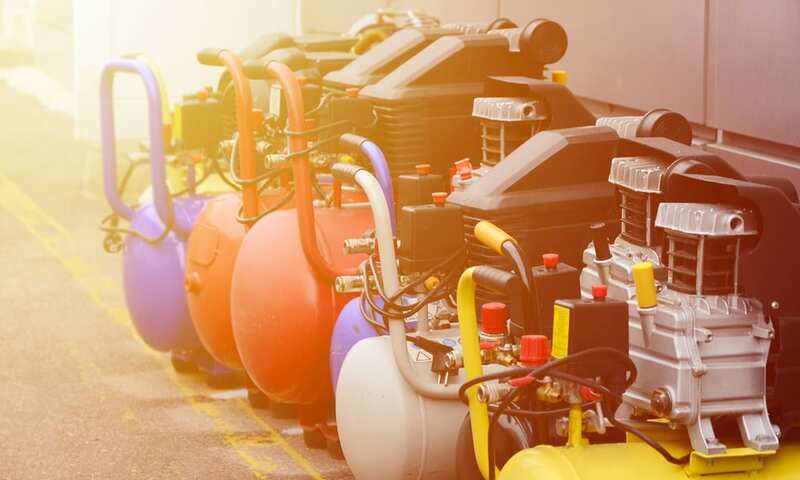 It seems to be the case that the majority or at least a larger percentage of small air compressors available on the market at the moment use oil-free tanks. This is definitely looking like the favorable option in terms of levels of maintenance and portability. People use small air compressors for smaller jobs, and therefore don’t want a lot of extra effort attached to their purchase. Oil-free tanks certainly provide that option better than small air compressors with oil lubricated tanks. One of the big considerations for air compressors is how noisy they will be and how much that bothers you. It might be very important to you that they are quiet as to not disrupt your workspace overly. However, it is worth noting that some air compressors operate very quietly (as low as 70 decibels in some cases) whereas some really don’t! It is down to how the product has been manufactured. The horsepower required for an air compressor varies from model to model. In general, an air compressor with a 30-gallon pump will only require around a 2 horsepower ratio in order to function properly. Though this seems quite low, it is perfectly adequate and will more than complete the job that you bought the air compressor for in the first place. Some air compressors will go up to 5/6 horsepower; however, that is at the higher end of the scale. The majority will function around 2/3 and sometimes four. Most manufacturers will provide all the information you need about the related horsepower requirements and capacities in their product information either online or with the product itself after purchase. Because it is absolutely essential to drain and maintain your oil-lubricated tank in your air compressor, you should probably know how to do it properly in order to avoid breaking your product. Each manufacturer will have different suggestions, and you should read them carefully, whichever brand you decide to go with. 2. Reduce the pressure right down. 3. Find the drain valve. 4. Open up the valve (tilt the tank if necessary). 5. Close up the drain valve. We hope you enjoyed our article on "10 Best 30 Gallon Air Compressors in 2019", if so, please share and rate it.